Astronomie - Hubble-Teleskop hat Ziel für Sternentstehung Studien. GRB 151027B, Swift's 1,000th burst (center), is shown in this composite X-ray, ultraviolet and optical image. X-rays were captured by Swift's X-Ray Telescope, which began observing the field 3.4 minutes after the Burst Alert Telescope detected the blast. Swift's Ultraviolet/Optical Telescope (UVOT) began observations seven seconds later and faintly detected the burst in visible light. The image includes X-rays with energies from 300 to 6,000 electron volts, primarily from the burst, and lower-energy light seen through the UVOT's visible, blue and ultraviolet filters (shown, respectively, in red, green and blue). The image has a cumulative exposure of 10.4 hours. 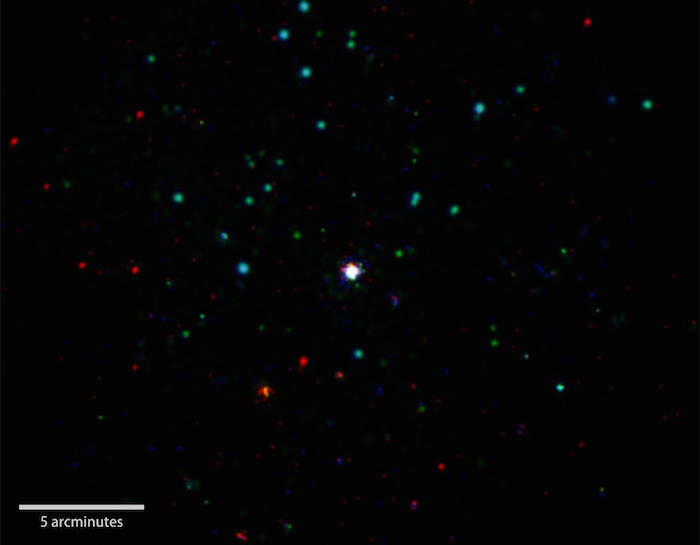 NASA's Swift spacecraft has detected its 1,000th gamma-ray burst (GRB). GRBs are the most powerful explosions in the universe, typically associated with the collapse of a massive star and the birth of a black hole. 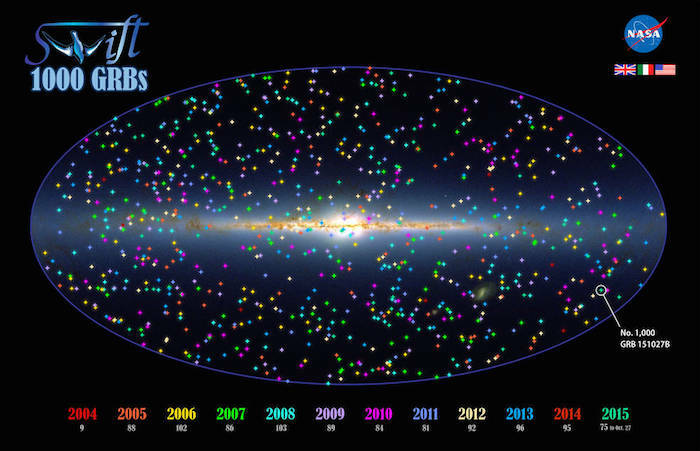 "Detecting GRBs is Swift's bread and butter, and we're now at 1,000 and counting," said Neil Gehrels, the Swift principal investigator at NASA's Goddard Space Flight Center in Greenbelt, Maryland. "The spacecraft remains in great shape after nearly 11 years in space, and we expect to see many more GRBs to come." A GRB is a fleeting blast of high-energy light, often lasting a minute or less, occurring somewhere in the sky every couple of days. Scientists are looking for exceptional bursts that offer the deepest insights into the extreme physical processes at work. 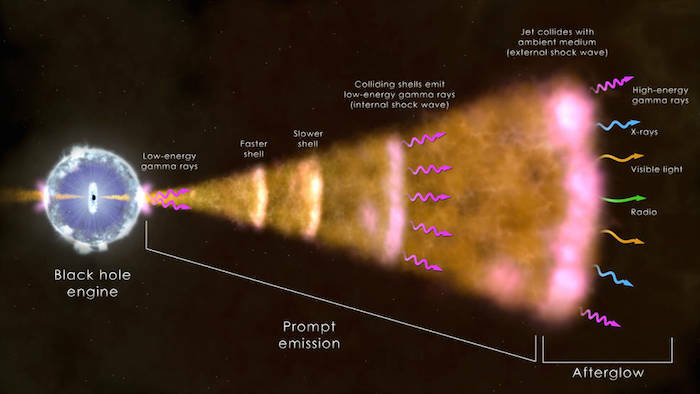 This illustration shows the ingredients of the most common type of gamma-ray burst. The core of a massive star (left) has collapsed, forming a black hole that sends a jet moving through the collapsing star and out into space at near the speed of light. Radiation across the spectrum arises from hot ionized gas in the vicinity of the newborn black hole, collisions among shells of fast-moving gas within the jet, and from the leading edge of the jet as it sweeps up and interacts with its surroundings. Shortly before 6:41 p.m. EDT on Oct. 27, Swift's Burst Alert Telescope detected the 1,000th GRB as a sudden pulse of gamma rays arising from a location toward the constellation Eridanus. Astronomers dubbed the event GRB 151027B, after the detection date and the fact that it was the second burst of the day. Swift automatically determined its location, broadcast the position to astronomers around the world, and turned to investigate the source with its own sensitive X-ray, ultraviolet and optical telescopes. Astronomers classify GRBs by their duration. Like GRB 151027B, roughly 90 percent of bursts are of the "long" variety, where the gamma-ray pulse lasts more than two seconds. They are believed to occur in a massive star whose core has run out of fuel and collapsed into a black hole. As matter falls toward the newly formed black hole, it launches jets of subatomic particles that move out through the star's outer layers at nearly the speed of light. When the particle jets reach the stellar surface, they emit gamma rays, the most energetic form of light. In many cases, the star is later seen to explode as a supernova. "Short" bursts last less than two seconds -- and sometimes just thousandths of a second. Swift observations provide strong evidence these events are caused by mergers of orbiting neutron stars or black holes. Once a GRB is identified, the race is on to observe its fading light with as many instruments as possible. Based on alerts from Swift, robotic observatories and human-operated telescopes turn to the blast site to measure its rapidly fading afterglow, which emits X-rays, ultraviolet, visible and infrared light, and radio waves. While optical afterglows are generally faint, they can briefly become bright enough to be seen with the unaided eye. "Over the years, astronomers have constantly refined their techniques to get their telescopes onto the burst site in the shortest possible time," said John Nousek, Swift’s director of mission operations and a professor of astronomy and astrophysics at Penn State University in University Park, Pennsylvania. "In fact, the process to follow up Swift GRB alerts is as productive as ever." GRB 151027B provides a perfect example. Five hours after the Swift alert, the burst location first became visible from the European Southern Observatory (ESO) in Paranal, Chile. There a team led by Dong Xu of the Chinese National Astronomical Observatories in Beijing captured the afterglow's visible light using the Very Large Telescope's X-shooter spectrograph. The ESO observations show that light from the burst had been traveling to us for more than 12 billion years, placing it in the most distant few percent of GRBs Swift has recorded. Astronomers now have distance measurements for about 30 percent of Swift GRBs, which makes it possible to investigate how these powerful events are distributed across space and time. The distance record is held by GRB 090429B, which exploded at the dawn of star formation in the universe. Its light took more than 13 billion years to reach Earth. This illustration shows the positions of 1,000 Swift GRBs on an all-sky map oriented so that the plane of our galaxy, the Milky Way, runs across the center. Bursts are color coded by year, and the location of GRB 151027B is shown at lower right. An annual tally of the number of bursts Swift has detected appears below the label for each year. Background: An infrared view from the Two Micron All-Sky Survey. In addition to its GRB studies, Swift conducts multiwavelength observations of a wide array of astrophysical phenomena, from nearby comets and asteroids to faraway quasars and blazars, galaxies where supermassive black holes produce unpredictable high-energy flares. "Swift is an amazingly versatile observatory, with gamma-ray burst detections every week, target-of-opportunity observations every day, and with a vast users' community covering all fields of astronomy," said Patrizia Caraveo, director of research at the Italian National Institute for Astrophysics in Milan and a co-investigator on Swift. "Swift has been a fabulous discovery machine, finding previously unknown types of outbursts from stars, galaxies and from gamma-ray bursts themselves," said Julian Osborne, who leads the U.K. Swift team at the University of Leicester. "It's great to see our national contributions to the mission's X-ray and UV/optical telescopes having such a big impact." With new types of astronomical observatories ramping up, Swift is poised to take on a new role. Ghostly particles called neutrinos have been detected from outside the solar system, and soon astronomers expect that gravitational wave observatories will detect the first ripples in space-time, a phenomenon predicted by Einstein's relativity theory. Swift scientists plan to use the satellite's capabilities to search for high-energy light associated with neutrino and gravitational wave sources. Swift was launched on Nov. 20, 2004. Managed by NASA Goddard, the mission is operated in collaboration with Penn State, the Los Alamos National Laboratory in New Mexico, and Orbital Sciences Corporation in Dulles, Virginia. Other partners include the University of Leicester and Mullard Space Science Laboratory in the United Kingdom, Brera Observatory and the Italian Space Agency in Italy, with additional contributions from Germany and Japan.